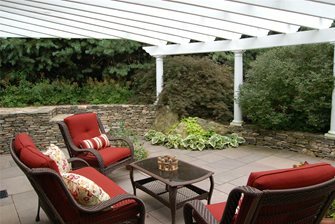 This small patio is enclosed with a pergola and plants. 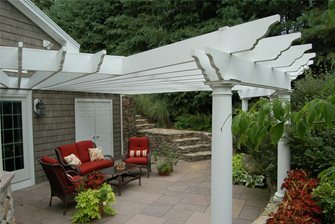 The pergola has a unique sunburst design. A stone path leads from the horseshoe driveway to the secluded patio. An 18" seat wall supports the natural topography and existing plants. 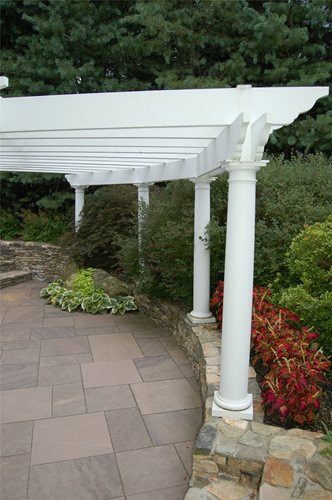 This small front patio and pergola in Lancaster, MA provides a relaxing haven. 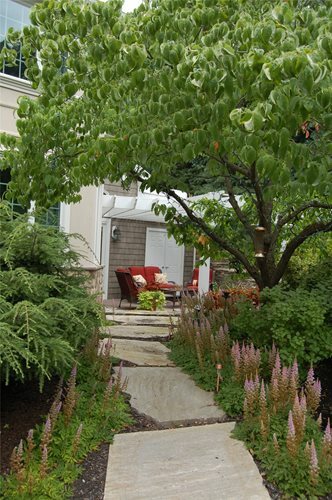 When Deb Perrault of Fieldstone Design came on the scene the homeowners wanted to improve their front entrance and upgrade their railroad tie paths. Patio size: approximately 300 sq. ft.
Design Goals Perrault decided to design an entrance path and small patio, as well as stone steps that would create a stronger connection between the front of the house and the existing pool in back. "There was a tucked away area between the horseshoe driveway and front entrance that was perfect for a small patio," she recollects. Perrault's main design goals were to create a sense of seclusion and privacy, as well as soften the space. She also wanted to avoid disturbing the existing topography and plants as much as possible. Landscaping Solutions In order to create a sense of seclusion and privacy Perrault took two approaches. First, she used the existing mature plants to her advantage. "Many of the plants that now screen the patio were already on the property," she explains. Second, she added a pergola overhead with a unique sunburst design. "The pergola acts as a ceiling," Perrault says, "making the space feel very cozy." Where the stairs enter the patio, the overhead beams are shorter so that guests do not have to duck under them when entering the sunken patio. 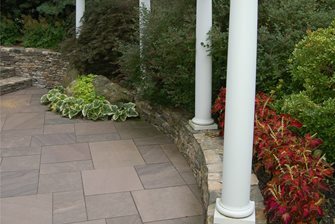 The patio itself is made of brownstone, while the surrounding walls and steps are made of flat fieldstone. With so much stone in a small space Perrault knew that she would need to soften the design. 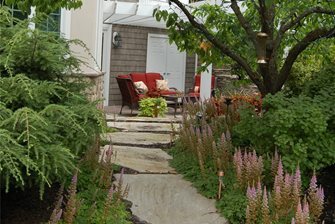 "We cut out planting beds along the walls and filled them with greenery and large boulders from on site," she explains. The sunken elevation of the patio was not achieved through excavation, as one would assume. Instead, Perrault worked with the existing topography which sloped naturally towards the house. "The 18 inch seat walls serve to support the soil and existing plant material," she says, "When planning the project I was very careful not to design anything that would disturb or compromise the natural grades and plants." Perrault was able to make good use of a small space by enhancing the sense of enclosure. Now the homeowners have a cozy front patio on which they can enjoy their morning coffee or read a good book.